We’ve had more than 5,000 students over our 15 years in business. One of the best things about keeping in touch with former students is to be able to see how they progress. We just received this wonderful picture from a group of wives of United Nations delegates that had been students here 2 years ago. The group took the class we customized for them with teacher Judy Doenias after Cathy & Judy gave them a talk about the past and present of quilting in the U.S. 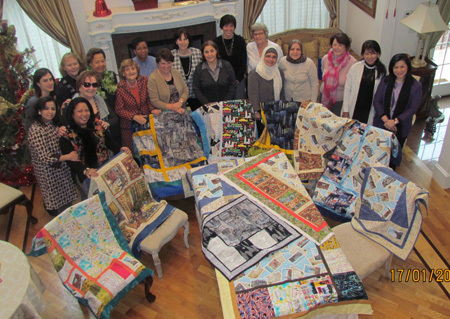 Ever since then, they have met regularly to make quilts and this is a photo of their latest efforts. As you can see, many of them feature New York-themed fabrics (from our shop–and some are our own, exclusive designs) as a memento of their time spent here in the States. The ladies represent Indonesia, Jordan, Madagascar, Germany, Libya, Trinidad, Malta, USA, Algeria, Czech Republic, Denmark, Myanmar and Brunei.